High Lowscales Byre, High Lowscales in Millom sleeps 2 people. High Lowscales Byre in Millom is located on a working farm. 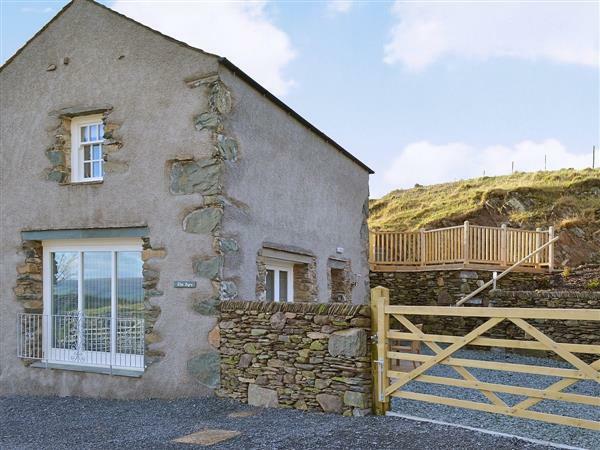 High Lowscales Byre is a two-storey detached barn conversion, one of two, and is situated in the south-western Lakes, between the beautiful countryside of the Whicham and Duddon Valleys. This holiday property is set in 17 acres and has spectacular views down to the Irish Sea and the Duddon Estuary. Public footpaths cross the farmland, and next door lies Millom Park, perfect for woodland walks. The driveway is also a bridleway, ideal for mountain biking in the Whicham Valley and up the 600m high Black Combe. 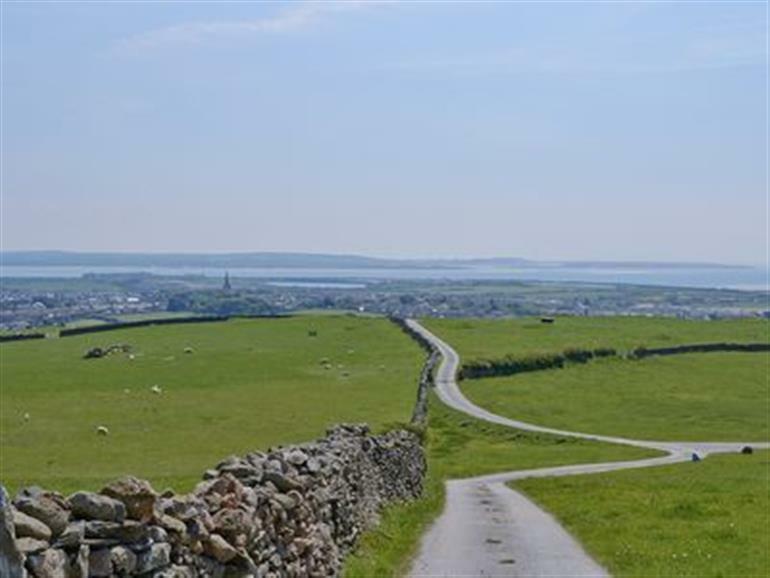 The beaches at Haverigg and Silecroft and the Hodbarrow RSPB reserve are a 10-minute drive, whilst the market town of Broughton-in-Furness is 15 minutes away. Within a half hour drive you will also find Coniston Water, the South Lakes Wild Animal Park at Dalton-in-Furness, Muncaster Castle and ’La’al Ratty’ miniature steam railway at Ravenglass, which all make for wonderful family days out. The Aquarium of the Lakes and steam boat cruises on Windermere are a 40-minute drive away. You can enjoy wonderful views from your very own spa hot tub, complete with massage jets, built-in sound system and feature lighting. In order to make guests’ stays as relaxing as possible; shopping, ‘drop off suppers’ and massage and beauty treatments (at the cottage) can be pre-ordered (separate charges apply). High Lowscales Byre in Millom is in the same location as ref 28559 [High Lowscales Farm]. The shop and restaurant are 2 miles; with the pub being 4½ miles from High Lowscales Byre. Ground floor: Living room with patio doors/kitchen with dining area, beams and wooden floors. First floor: 1 double (5ft) bedroom. Bathroom with shower over bath, shower cubicle and toilet. Gas central heating, electricity, bed linen and towels included. Freesat TV. DVD. iPod dock. Induction hob. Electric oven. Microwave. Washer/dryer. Dishwasher. Fridge/freezer. Wi-Fi. Telephone-incoming calls only. Enclosed patio with sitting-out area and furniture. Decked balcony. Shared 17-acre grounds. Barbecue. Parking (1 car). Cycle store. Saltwater hot tub. Natural water supply from bore hole. Welcome pack. Pets free of charge - to be kept on a lead, sheep country. No smoking. Holidays at High Lowscales Byre in Millom run from Holidays run from Friday to Friday. No children. NB: Stairs to patio from balcony. 8 steps to patio. For a better idea of where High Lowscales Byre is, you can see High Lowscales Byre on the map below. High Lowscales Byre is in Cumbria; should you be on the lookout for a special offer, you can find all the special offers in Cumbria. It's always worth checking to see what is on offer at the moment. Do you want to holiday near High Lowscales Byre (30155), you can see other cottages within 25 miles of High Lowscales Byre; have a look to find your perfect holiday location.